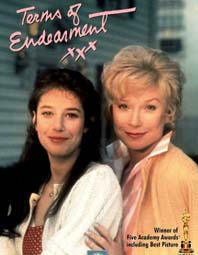 The film explores the relationship between a neurotic mother (MacLaine) and her determined daughter (Winger) who marries a philandering teacher. James L. Brooks (who also won the Oscar for direction, and this is his first outing as Director). With Jeff Daniels, John Lithgow, Lisa Hart Carroll, and Danny DeVito. James L. Brooks ( - ) American writer/director who's first producing credit is this film. Brooks's other production credits include: BROADCAST NEWS. In addition, he has been involved with several television series for FOX TV, including: THE SIMPSONS. The director, James L. Brooks also won the Oscar for best Screenplay (based on material from another medium).